Stay tuned for upcoming events for An Evening with Abida Parveen in near future. Abida Parveen will perform live on 12th November 2017 at Alhamra Arts Council in Lahore. People in Lahore and nearby cities enjoy the melodious performance. 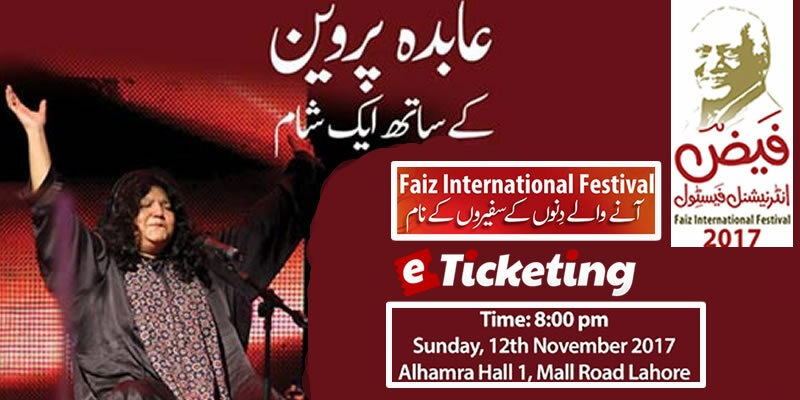 Come watch her perform live at Alhamra Hall 1. Abida Parveen is a popular Sufi singer of Pakistan. She is acknowledged as the Sufi Queen of music. Belonging from a Sindhi Sufi family, she composes her own music. She sings mainly Ghazals, Qawwali, Raga, Khyal, Thumri, Classical and Sufi rock. Faiz Foundation Trust promotes the progressive and humanistic ideas of Faiz Ahmed Faiz, one of the most famous poets of Pakistan. It was formed in November 2008 and was registered under the Societies Registration Act, 1860 in February 2009. Faiz Ghar is a project of the Faiz Foundation Trust, set up for the promotion of the ideology of Faiz Ahmed Faiz. Terms & Conditions : Faiz Foundation Trust reserves the right of admission to the venue and event. Best Viewed at 1024 x 768 pixels and above. This Page loaded in 0.06702 seconds on Tue, Apr 23, 2019 (21:37).